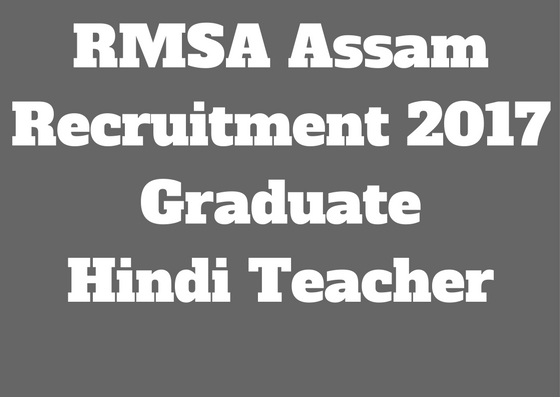 Rashtriya Madhyamik Siksha Abhijan, Assam hereby invites applications from eligible Special TET (Hindi) passed candidates in prescribed format for recruitment in 19 posts of Graduate Teachers (Hindi) in Adarsha Vidyalaya of Assam. Pay scale for the posts is Rs.14000/-- 49000/-(PB-2) plus Grade Pay of Rs. 8700/- only as mentioned detail in the official website of RMSA. 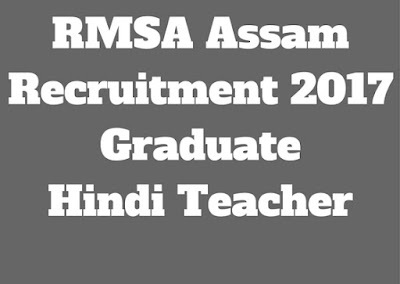 The RMSA Assam TET Recruitment of Graduate Hindi Teacher appointments shall be made purely on contractual basis maximum for a period of 5 (Five) years however the contract of only those candidates shall be renewed after every 11 months judging the scale of their performance level and dedication. B.A with Hindi as one of the subject or Pravin/ Ratna in Hindi with 50% marks having degree qualification from any recognized University with B. Ed or Hindi Shikshan Parangat / Hindi Sikshan Nishnat and Special TET (Hindi) Qualified. Proficiency in English and Assamese Language will get preference. The Applicants must submit their application to the Office of the Mission Director, Rashtriya Madhyamik Siksha Abhijan (RMSA), Assam, SSA Campus, Kahilipara, Guwahati, Assam PIN-781019 by hand or by post on or before 20th June during office hours. H.S.L.C: Admit Card, Mark Sheet, and Pass Certificate. Graduation: Mark Sheet and Pass Certificate. B. Ed Degree: Mark Sheet and Pass Certificate. Two recent passport size self-attested Photographs with the application. Certificate of NCC (B & C Certificate), Sports and Cultural (representing State or Nation). A copy of Permanent Residence Certificate. Teaching Experience Certificate (if any). An application fee of Rs. 100/- only (for ST/ SC candidates Rs.50/- only) must be submitted in the form of Demand Draft in favor of Mission Director, RMSA, Assam payable at Guwahati along with the application. 100 marks on percentage of marks in B.Ed. Maximum 30 marks for teaching experience @ 2 marks per year of teaching experience in Higher Secondary School/ High School having enrollment more than 100. Shortlisted applicants must carry all the attested photocopies of certificates in proof of Age, Qualifications, Experience, Pay Scale and Category along with the original when called for verification. Merit basis candidates’ shortlist will be uploaded on RMSA website www.rmsaassam.in and called for original documents verification and interview. Admit Card, Mark Sheet and Pass Certificate of H.S.L.C. Mark Sheet and Pass Certificate of H.S.S. Mark Sheet and Pass Certificate of Graduation. Mark Sheet and Pass Certificate of B. Ed Degree. Pass Certificate of Special TET (Hindi).